Galas are often long affairs. And this one was no exception. Manuel Legris was fortunate to be mentored in his early dance career by Rudolf Nureyev during his reign at the Paris Opera. There is a Nureyev gala in Paris and now there is one in Vienna. I still question whether it makes sense to so honour someone who recklessly infected others with HIV but I do understand Legris’s attachment to the teacher who gave him so much. The evening opened with a fine excerpt from La Sylphide with full decorations, with Maria Yakovleva in the eponymous title role and Masayu Kimoto as her partner. While La Sylphide is always easier to watch in its entirety both were very good and the corps-de-ballet looked good too. An auspicious start. In John Neumeier’s Vaslaw, Denys Cherevychko carried the lead role. It’s very good casting, as Cherevychko’s habitual narcissism works to good effect in Vaslaw’s solo gymnastics and diffident interaction with the other couples. Prisca Zeisel starts to justify the high hopes placed on her precocious arrival at age sixteen in the Vienna Staatsoper, as the great Austrian principal, a role left vacant since Dagmer Kronberger left at the height of her powers to motherhood. 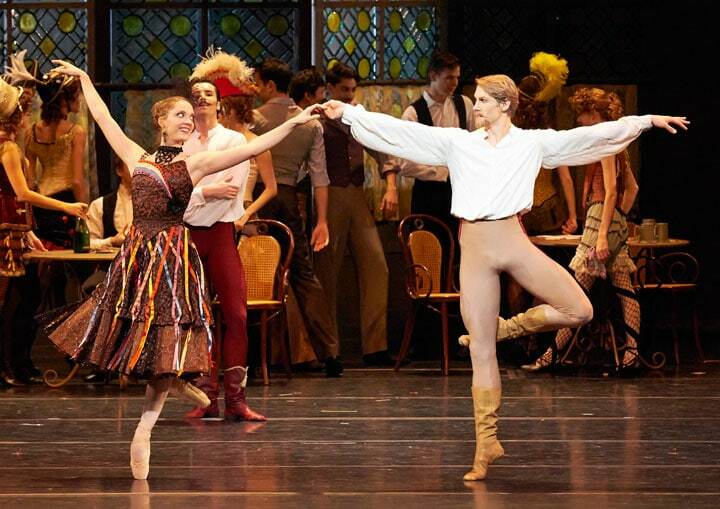 Kronberger is dancing marvellously but has not had the same roles she had before leaving. Alexandru Tcacenco did an excellent job partnering the lyric and self-assured Zeisel. Masayu Kimoto’s moved the audience with a passionate solo: Kimoto was both emotional and in excellent physical form, really finishing his movements. Ketevan Papava and Ryan Booth are a very dramatic couple. Both tall, they were very effective together. The pas de trois was a little bit unbalanced. Kiyoka Hashimoto and Davide Dato danced well together, as did Alice Firenze and Greig Matthews, without drawing particular fire or attention to themselves. The pas de cinque from Swan Lake was performed to a blue backdrop and was rather a bore without decorations. Eno Peci was a marvellous prince, while Natascha Mair and Ioanna Avraam were lovely noble damsels. As companions, Davide Dato and Dumitru Taran partnered their damsels very well. I would have preferred to see Peci’s magnificent physique and radiant presence as Apollo later. While Peci is great on stage, his technique could be sharper: he seems just a bit lazy as a dancer before the show which is a great pity as he has international star potential. The highlight of the evening was the pas de deux from Mayerling. Here Kenneth MacMillan’s masterwork had the best possible casting. Irina Tsymbal lived the role of the impetuous Baroness Vestera while Kirill Kourlaev incarnated Crown Prince Rudolf. Kourlaev’s appearance with moustache and goatee is spectacularly dashing. He should consider dancing the grand roles with facial hair. Tsymbal and Kourlaev’s passionate embraces felt truly real. Tsymbal gave herself to Kourlaev with abandon. One felt her folly with the pistol, one felt the passion of woman on the edge. Every one of her movements was both lyric and transparent. Kourlaev’s masterful steps and dignity belonged as much to the theatre as the ballet. I felt like I was watching Ekaterina Maksimova and Vladimir Vasilev in their prime. Vienna has a very special pair in these two. They are a perfect match. Hopefully they will be kept together for most of next season. Someone should invite a choreographer to create something dramatic just on these two. They are in another league as partners to anyone else in the theatre. In Apollon, an excellent performance by the orchestra brought the score alive. On stage we saw the best dancers Vienna has to offer. The three graces included Olga Esina, Ketevan Papava and Nina Polakova. Esina and Papava are schoolmates and rivals for the last fifteen years first in the Vakhtangova Ballet School, then a few years in the Marinsky Theatre and finally in Vienna State Opera. Both are classic St Petersburg ballerinas, with long arms and legs and perfect technique. And here in Apollon they offset each other ideally, one tall and fair, the other long and dark. Polakova did well to keep them company but perhaps Ionna Avraam would have been a better match. Hopefully one day perhaps a perceptive choreographer will take advantage of these twin graces, dark and light, and build a piece based on fragmented personality or twin loves. As an example, one could rework Swan Lake in an entirely new version with Odetta/Odile on stage at the same time. Roman Lazik did not look as strong as Apollon as he has all year, in what has otherwise been a banner year for him. Apollo should really be a Nijinki or Nureyev style dancer who summons the whole theatre to his godlike presence. With just a couple of workouts per week, in a few months, Lazik could put on the two or three kilograms of upper body muscle he’d need for such a role. A tall, elegant dancer if he wants to become a power on the stage, he should muscle up a bit.